News from LMCU: Max gives back! 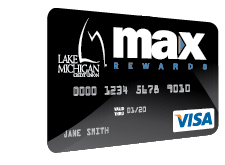 If you still haven’t signed up for a Max Rewards Visa credit card, you’re missing out! Take advantage of this versatile card that has no annual fee, no balance transfer fees, and the ability to earn and redeem points for cash, travel or even merchandise. Apply today by calling (616 or 800) 242-9790, online at lmcu.org or visit any branch location.